Frenkie de Jong turned down the offer of a 'blank cheque' from Paris Saint-Germain to seal a dream move to Barcelona in January. The 21-year-old, who made a £75million switch from Ajax to the Nou Camp, was also wanted by the French giants and Premier League champions Manchester City. De Jong had appeared set to move to PSG before a late intervention from Barca, but that didn't stop the Ligue 1 leaders making a desperate attempt to sign him. 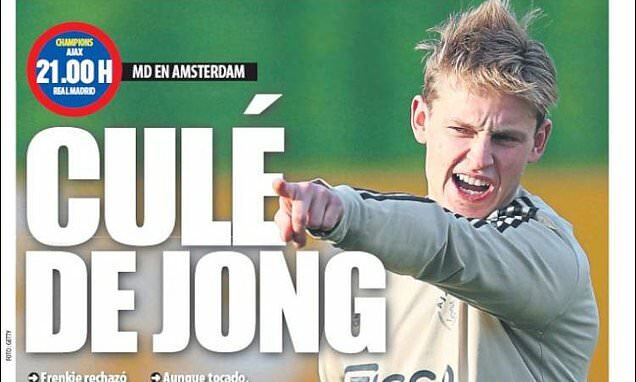 According to Spanish newspaper Mundo Deportivo , PSG chiefs called De Jong's agent, Ali Dursun, seven times during his final meeting with Barcelona.